Today marks the start of my second week in France. This sounds absolutely ridiculous to say out loud and in print, because with everything I’ve done, I feel like I ought to have been here for at least double that time. We all arrived in Paris on January 6 to report for Orientation. I’d flown overnight, as had most everyone else, and we were all extremely jetlagged. We met the Resident Director of CIEE-Rennes at the airport and a bus took us to the hostel. And then…we saw as much of Paris as is humanly possible in three days. I do not exaggerate when I say there wasn’t a single moment when I wasn’t having fun. We were a big group, so it was pretty obvious we were tourists, but the program gave us different options of things to do each day. Every morning we could pick between to places—hmm, the Eiffel Tower, or the Louvre?—and then after lunch we all had a mandatory excursion with a tour guide. 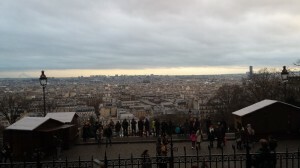 One day we went to Montmarte (a small mountain in the northern part of Paris also home to the Sacré-Cœur Basilica), and the other, Isle de la Cité (one of Paris’ two islands and the place with—maybe you’ve heard of it?—Notre Dame Cathedral). View from the top of Montmartre–a photo doesn’t do it justice, so go see it in person! I also had the privilege of being able to visit the Paris Catacombs, a relatively unknown location full of history. We paid a group fee to have a tour in English, which turned out to be invaluable. 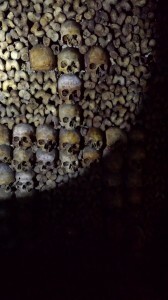 The Catacombs are both an old quarry and an ossuary. They weren’t even in Paris at one point—which is why they have all the bones. The condition of the Parisian cemeteries was at one point so bad that Louis XIV ordered them all to be emptied and put into the quarry he had just ordered to be mapped. They think there’s around 6 million people buried in there. Skulls arranged to resemble a doorway to heaven. 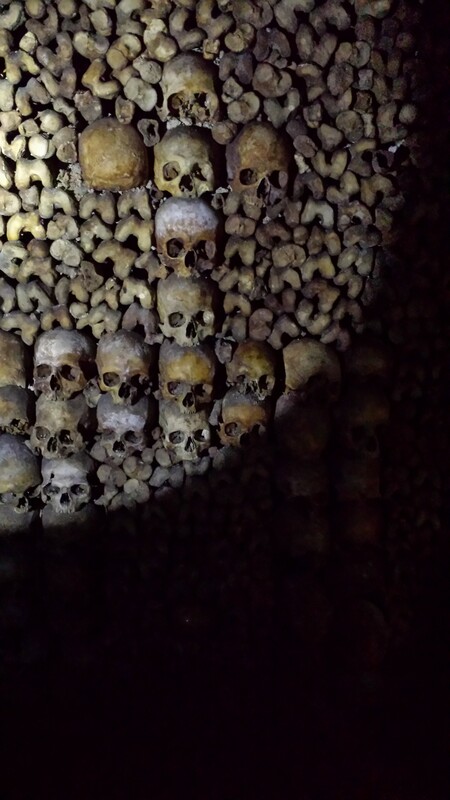 If you want to be simultaneously awed and creeped out, visit Les Catacombes. 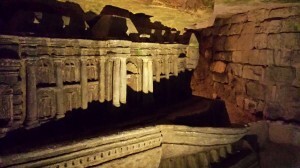 Even though I was super interested in the story of the quarry and catacombs, I felt a little freaked out by the series of tunnels with bones stacked about five or six feet high. I was expecting some sort of barrier between us and the remains of human beings, but nope! I could have reached out, grabbed a skull, and said “Alas, poor Yorick!” if I’d wanted. But I was told I’d be fined if I did that, so I refrained. A carving done by one of the quarry workers. According to our guide, he had planned to show it to his friends the very day he was crushed to death while working. Not what you picture when you think of Paris, eh? After a couple days, of course, we all climbed on a bus and headed to Rennes, where we’re eagerly and nervously waiting for our classes to begin! À bientôt! See you soon!